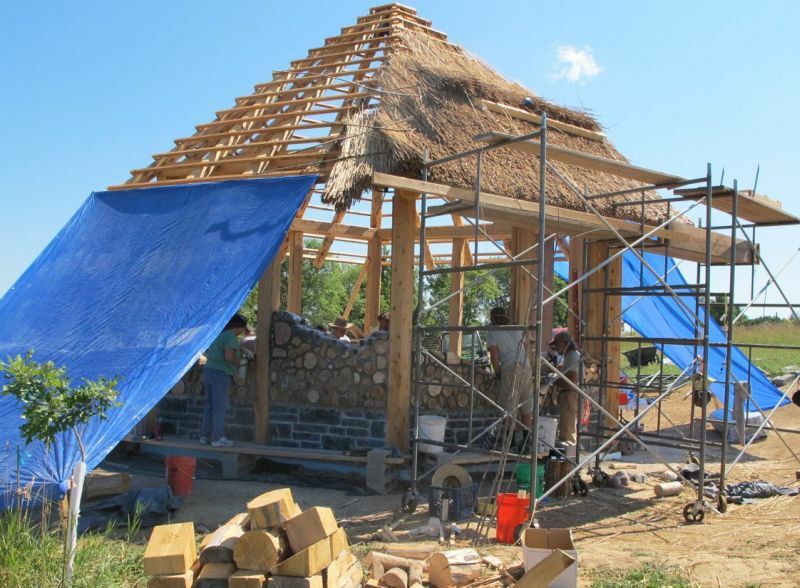 The framework for the Cordwood Chapel is a hexagon with a partially thatched roof. 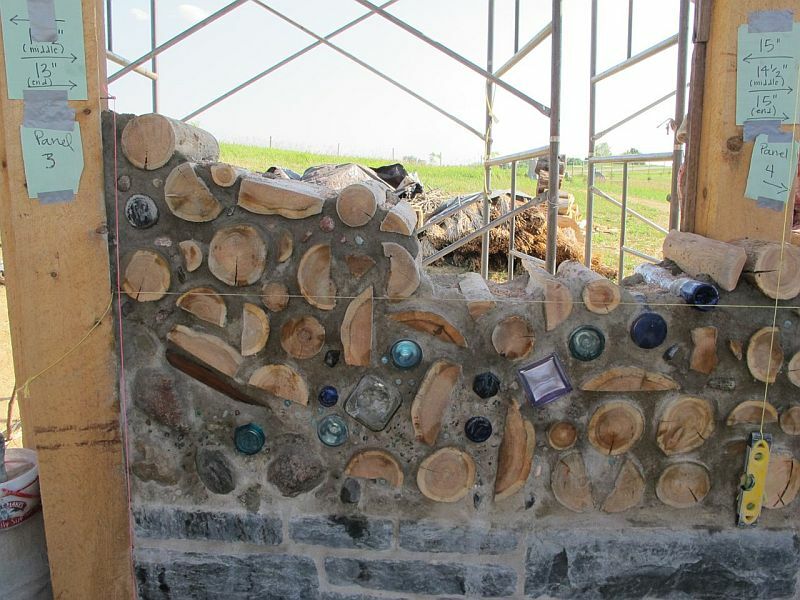 There is a stone wall for the first 24 inches. 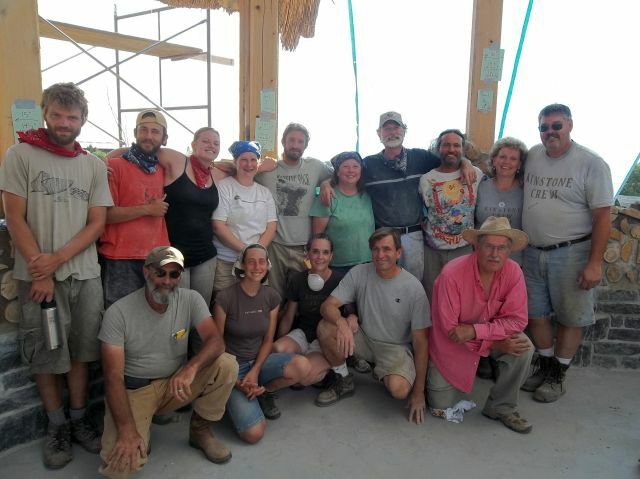 The workshop crew after three days of cordwood infilling. 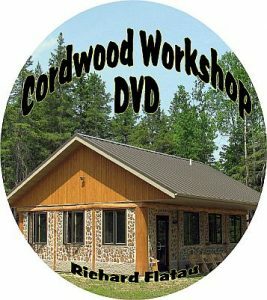 We are using Northern White Cedar and Red Pine for the 16″ cordwood infill. 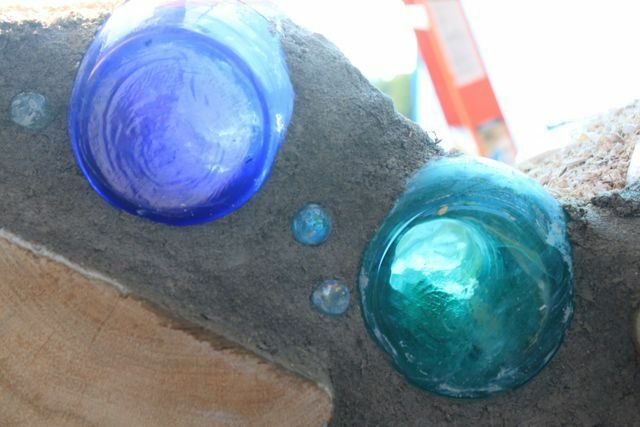 The Mississippi River is running through the wall with blue and green bottle ends. 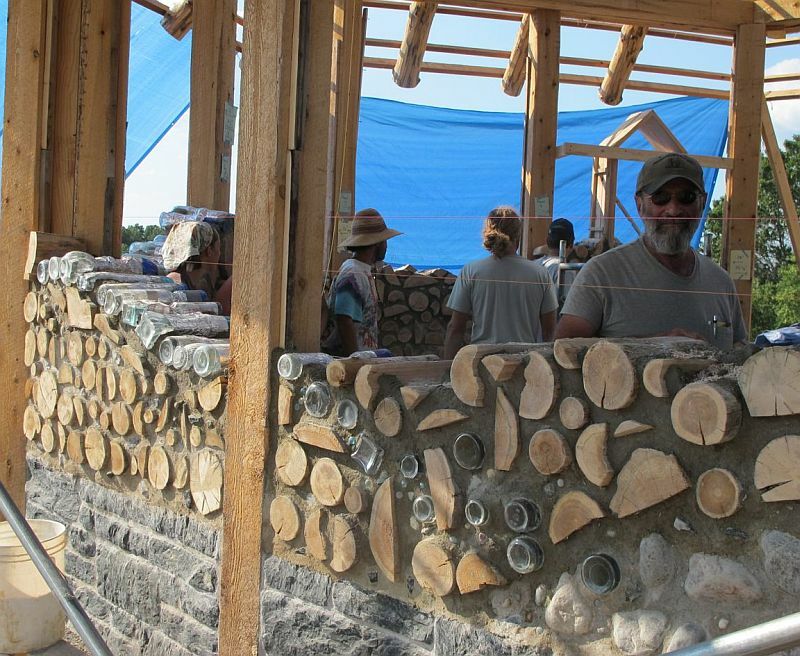 Stones and rocks and smooth glass are also being inserted as we mortar. 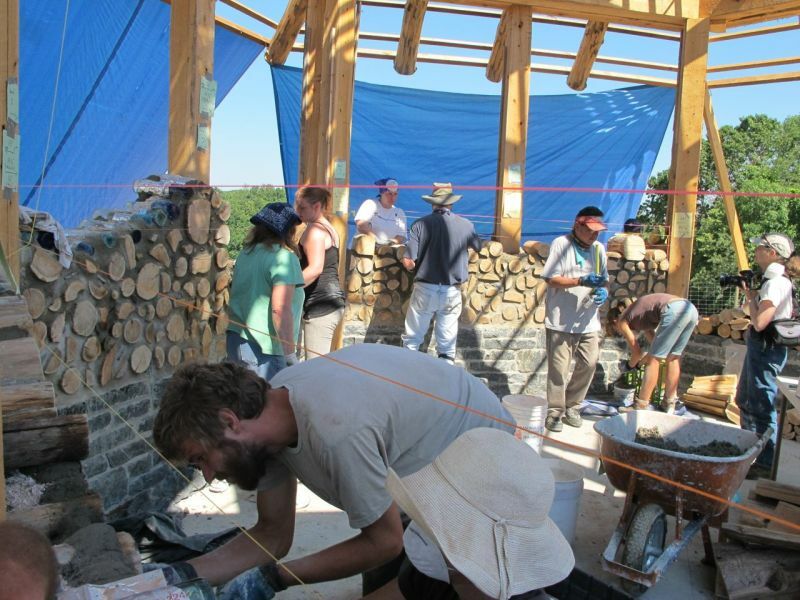 In order to not have the sun’s drying raise hit the mortar directly as we lay mortar, we have tarped the building to make sure we mortar in the shade. 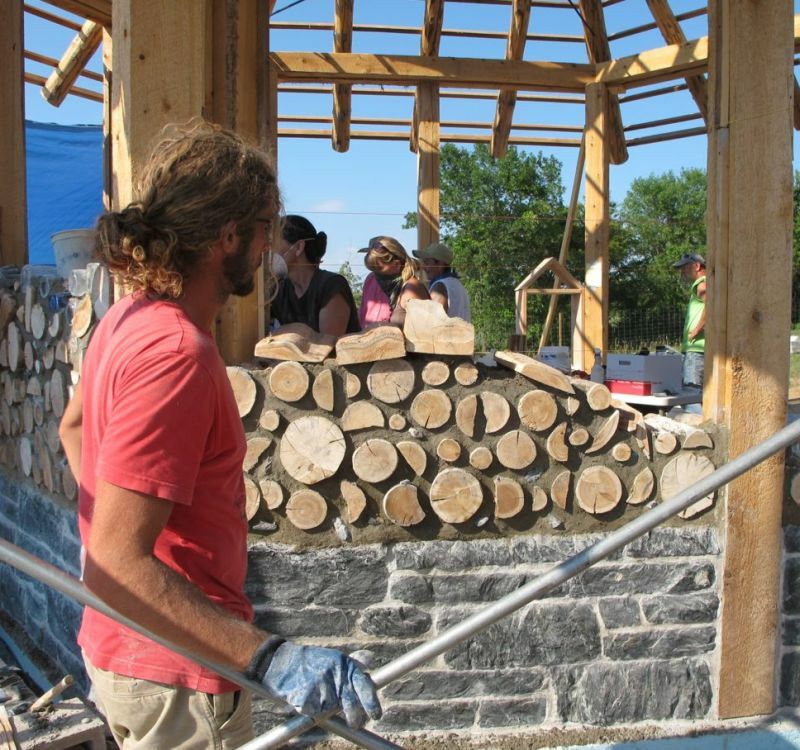 Each evening we cover the cordwood with tarps to slow the set and cure of the mortar. 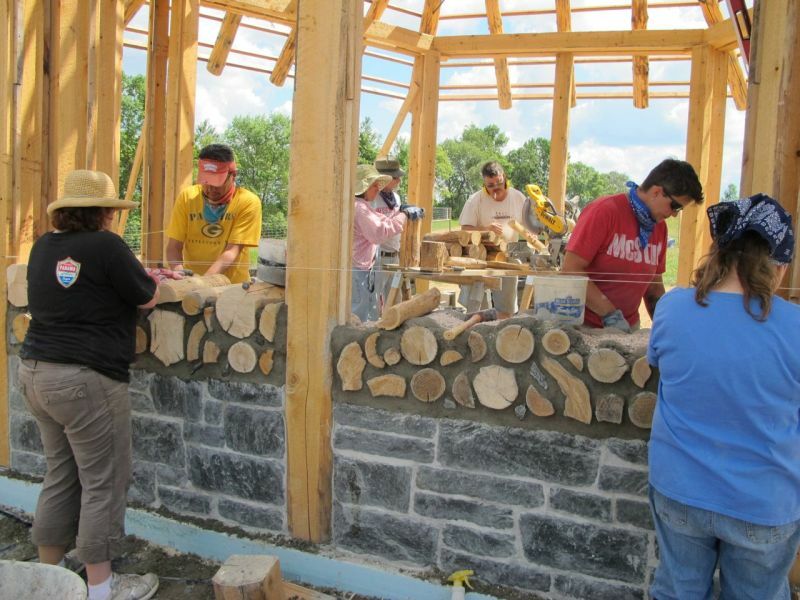 Here we are adding a window buck (box) to hold a window once the building is finished. 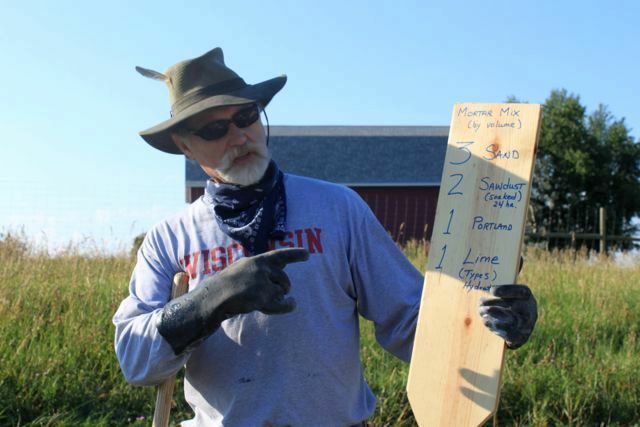 Cliff is showing us how to use a string to level all four windows. 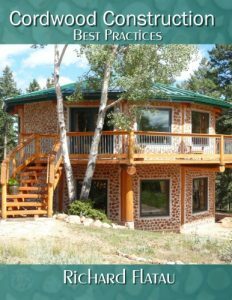 Right next to the Cordwood Chapel is a huge megalithic stone circle and a labyrinth. It is a very special place. 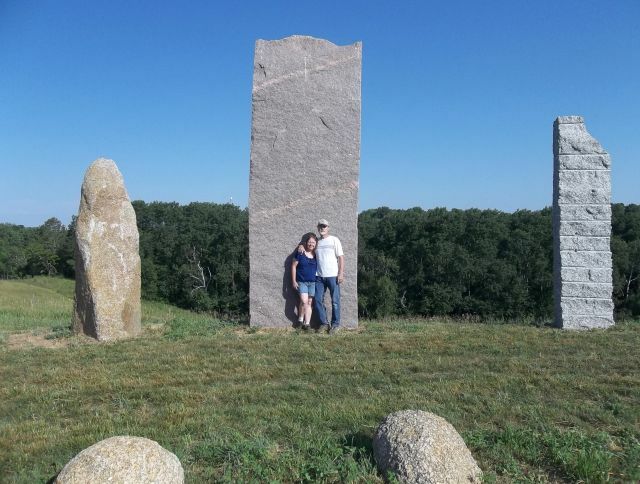 Happy and joyful cordwooders with stone circle in the background. 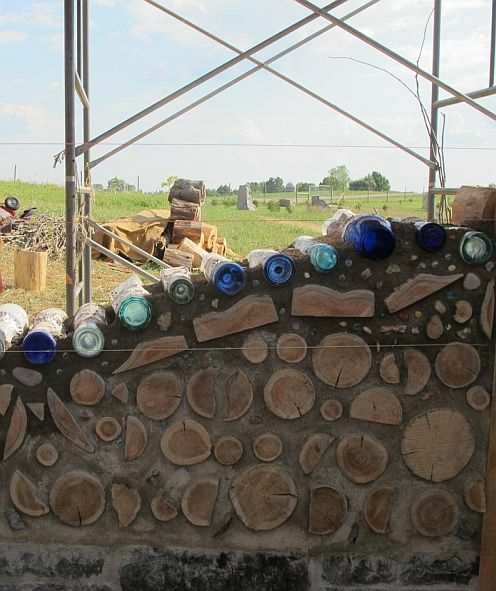 Stained glass bottle ends are being used to create a river motif in the cordwood walls. 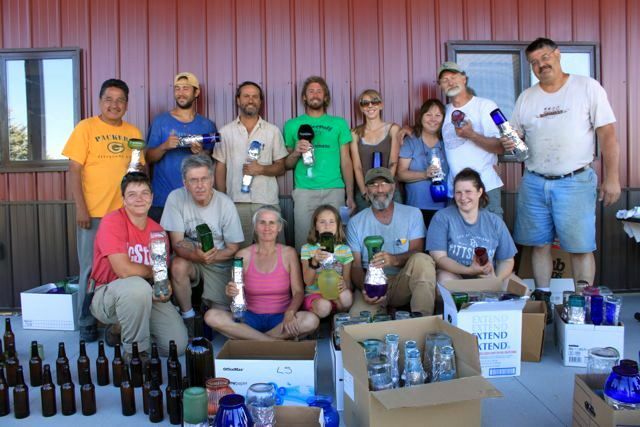 Stained glass bottle ends were made one afternoon when we were waiting for the heat to dissipate. Each person is posing with their favorite creation. We had lots of fun making different kinds of bottle ends. Jerry gets his tuck pointing just right! 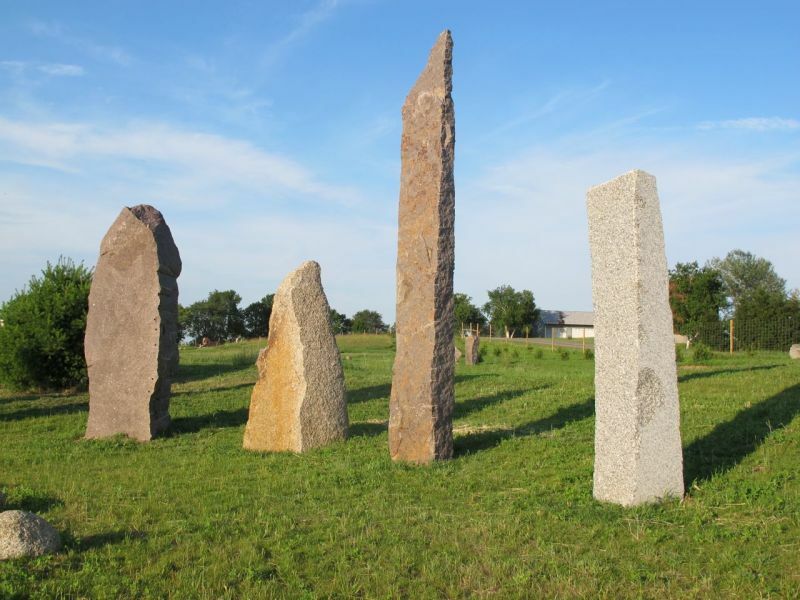 Another view of the stone circle. 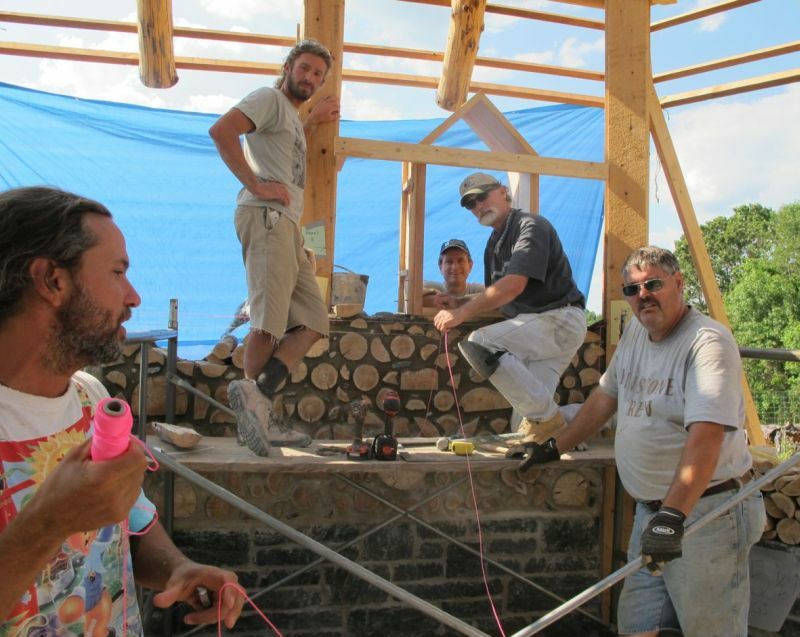 Makes one want to do ones best, there is power and energy at this site! Horizontal level lines help us keep the wall square, level and plumb. Wayne keeps a watchful eye on all the activity. 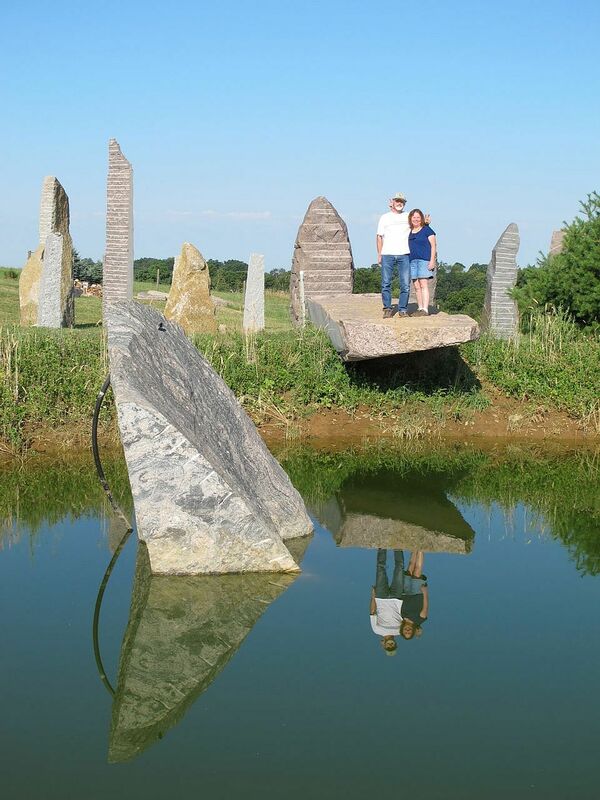 A stone circle pond leads from the Chapel to the Stone Circle. 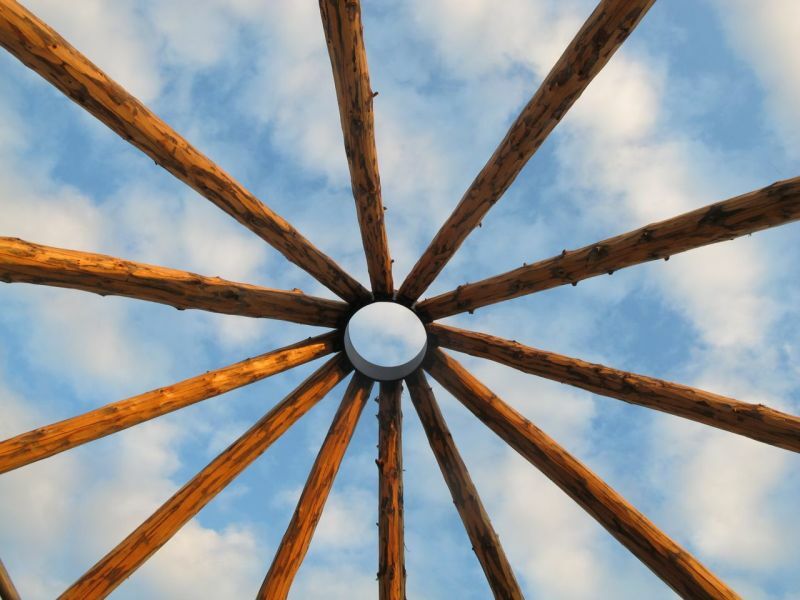 On the roof of the chapel there is a tension ring or compression ring. This takes the weight of all the posts and distributes it evenly. There are also 6 cables that run from a similar tension ring placed 8′ lower. 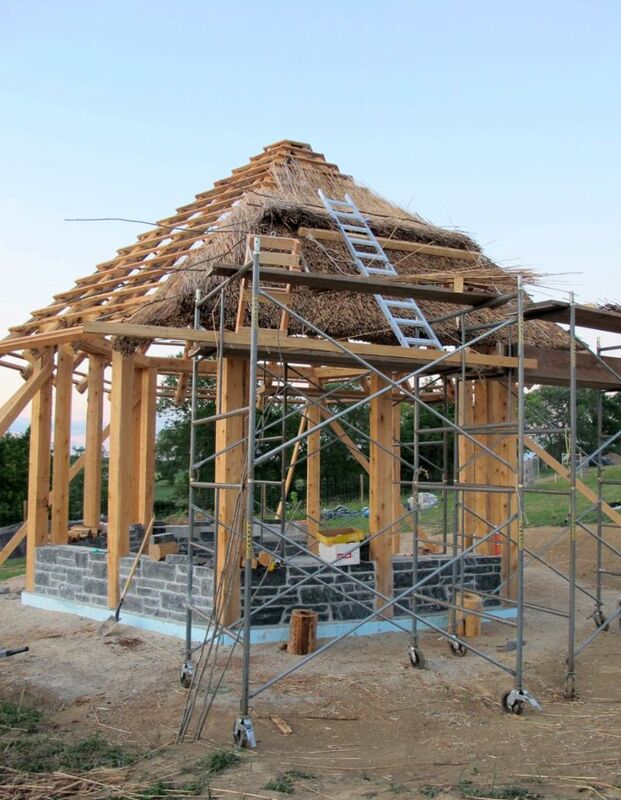 These allow the weight of the roof to be distributed evenly. 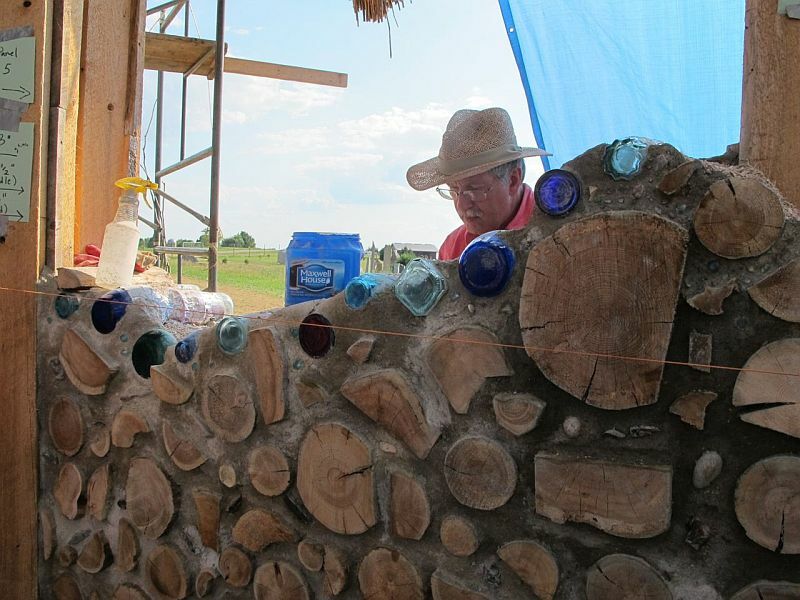 Tuck pointing is a very important procedure with cordwood. 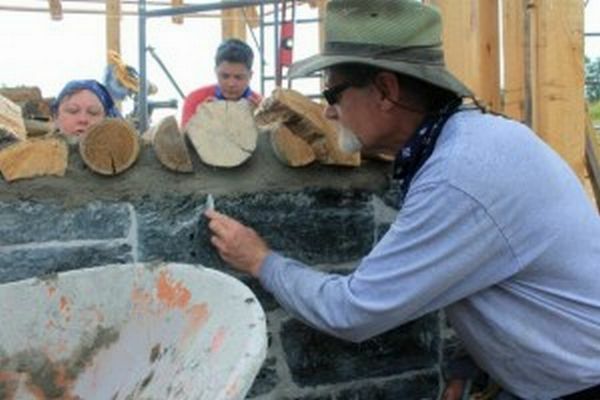 Not only does it strengthen the mortar joint, but if done properly it results in a smooth clean wall. 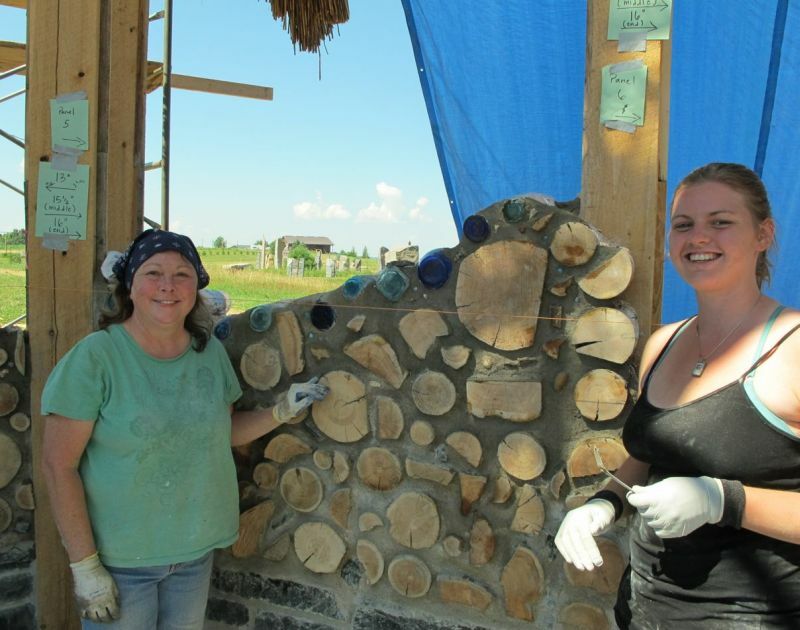 Learning the cordwood technique takes practice, but these good people learned quickly and well.